When I was a teen, I remember sitting in a friend’s kitchen with the producer of a show on our public radio station. “Are you listening to The Morning Program on MPR?” Um, no. I was listening to light rock, Top 10. I was 16. “You should be,” she exclaimed. “It’s the best thing on radio.” She immediately turned the radio on. We listened while finishing our breakfast. I was intrigued. Garrison Keillor and Jim Ed Poole (Tom Keith) played folk and classical music and performed skits with characters who became members of the family (Dr. Larry Kyle, B. Marty Barry, Captain Billy). From 6 to 9 am Monday through Friday, listeners were transported to another realm. 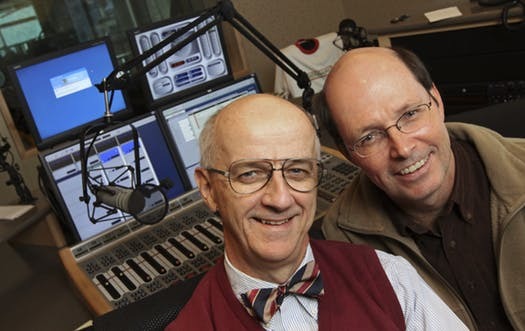 When Garrison Keillor left for A Prairie Home Companion, Dale Connelly became Jim Ed’s co-host. Tom Keith was a master at sound effects and voices. Dale Connelly wrote skits and dialogue which the two performed EVERY WEEKDAY. A true feat. Together, their sense of humor and wry observations of life helped listeners be aware of the world without taking everything too seriously. They were a tour de force. The show stopped broadcasting in December 2008, leaving a hole in my heart. Day #60: Dr. Martin Luther King, Jr.